Okay, so writing is one thing that I adore (evidemment). But at different points in my life, it has meant different things. At one point in time, it was for anger management. Yes anger management. This was especially the case when I was in junior high (JSS) and one of my classmates or another would annoy me. You know how adolescents are: They’re already confused and their homonal imblanaces go and confuse them some more. Anyway, when someone tried to anger or annoy me, I would just pick up a pen/pencil and scribble away. And it worked wonders many times. Eventually, I started compiling all those “Calm yourself down” notes to myself and thought about how difficult being a teenager or adolescent is. Thus came another era in my experience as a writer. I wanted to do something that was beneficial not only to myself, but most likely to other young people who were undoubtedly going through similar issues as myself. I got that opportunity when I worked as an Administrative Assistant and Editor at a newly formed publishing company in Accra, Piper Editions. Thus came the concept of “The ’16’ Journal”. 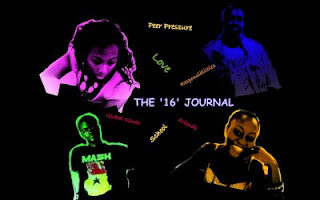 Basically, “The 16 Journal” is an interactive self-help book that is a compilation of journal entries by 4 teenagers – Tungtaeya, Bolade, Afi and Mash. The teenagers talk about their lives, impressions about life, lessons learned etc under 5 categories: Family, Relationships with Girls, Relationships with Boys, Work/School and Miscellaneous (various topics of interest). The aim of the book was to showcase the realities of teenage life in Ghana, highlight the pressures that teenagers undergo, and outline some of the lessons or realizations that can be made from the respective experiences. I co-authored this book with two great writers Akua Afi Asare-Anim and Masahoud Codjoe – we were all between the ages of 17-19. Unfortunately, although we finished writing and edited the entire manuscript, and even have a compiled hardcopy, we never actually got to publishing it due to various reasons. But guess what?! You guys get to read the entire manuscript right here on Circumspect!! I will post a number of chapters of the book online each week until the entire book is on here. It will also be under the label “The ’16’ Journal so you can access the entire thing easily. I hope that someone out there might be able to relate to one or more of the stories, and learn something from it. You can also try to guess which teenagers I wrote (There are two of them, a boy and a girl), but I doubt you’ll be able to solve that mystery cos my writing back them is sooo different from how I write right now. Anyways, I hope you enjoy this, and like always, sharing is caring so feel free to direct people who might be interested to the blog. [All the entries are copyrighted though so please, no plagiarizing!!!!] First preview coming up!